Nowadays and since Emerson Fittipaldi’s era, Brazil has been one of the main countries involved in Formula 1, thanks to its drivers ranging from Piquet to Senna, from Serra to Barrichello, from Pace to Massa. This was not exactly the case before 1970 - just a handful of Brazilian drivers participated in the F1 World Championship in the 1950s. Moreover, the results were hardly a match of those of Fittipaldi, Piquet and Senna. Among these pioneers, Hermano Joao Da Silva Ramos had a career that was characterized as a mix of gentleman driver and professional driver. He was the third Brazilan driver after Chico Landi (whose first World Championship GP came in 1951) and Gino Bianco (first GP in 1952) and, on several occasions, he left his mark in racing history. Nano (as friends called him) was born on the 7 December 1925 in Paris, France. His father was Brazilian and his mother French. Thus he has both nationalities. It is worth saying that in most statistics he is considered a French driver by French journalists and a Brazilian by Brazilian journalists. Other journalists just consider him as a Franco-Brazilian driver... Anyway, he speaks Portuguese and French fluently and lived in France most part of his life. But he was, above all, a racing driver. He began practicing motor racing at the age of 21 by entering the Interlagos GP in Brazil in March 1947. He drove an MG TC and had to retire whereas the race was won by Varzi, followed by Landi and Bianco. He really began racing in 1953-1954 with an Aston Martin DB2/4 in sportscar races in France. He and some friends who were fond of racing as well used to go to the Action Automobile Bar whose boss was Harry Schell. Edmund G. Nelson, one of Nano’s best friends, was also a close friend of a Spanish nobleman with a strange name: Alfonso Cabeza de Vaca (“cow’s head”), Marques de Portago. We can even say that Hermano Da Silva Ramos was one of the guys who were at the origin of Fon´s passion for racing: One day Nano asked Nelson to invite Alfonso de Portago to a minor rally event, the Sablé-Solesmes Rally, near Le Mans. That’s what he did and thus the Spanish nobleman discovered car racing. That is also how Alfonso de Portago and Nano Da Silva Ramos became close friends: “He was an exceptional guy and a very charming person,” the Brazilian/French driver said of him. They often traveled to races together and spent a lot of time in restaurants or night clubs like l’Eléphant Blanc in Paris. 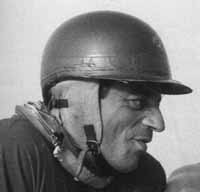 In 1954, Da Silva Ramos finished 2nd in the Paris Cup at Montlhéry and, above all, participated for the first time in the 24 heures du Mans with Jean-Paul Colas as co-driver. He was the very first Brazilian to take part in the prestigious French race. The two had to retire after 14 hours with broken transmission. At the end of the year he debuted a Gordini type 18 in the Salon Cup but had to retire. In 1955 he bought a Gordini 43, a sportscar, but kept his Aston Martin to participate, among other events, in the Mille Miglia, in which he finished 16th with Jean-Claude Vidilles, a French driver that participated in some non-championship F1 races in the 1960s. “It was a terrible and very dangerous race. Every year spectators died because of cars crashing into the crowd. The organizers did not want to let reporters know this because the Mille Miglia was so important for Italian car manufacturers and Italy: it was one of the most prestigious races in the world.” Hermano also went to the French colonies in North Africa with his Gordini and finished 5th at the Agadir GP in Morocco and 6th in the Dakar GP in Sénégal. Then he went back to France and won the Speed Cup in Montlhéry. One month and a half later, on the same circuit, he and Jacques Pollet, a young French driver who was one of the official drivers of the Gordini F1 team, finished 4th in the Bol d’Or. This was a terrific performance as they led the race during six of the 24 hours but unfortunately they had to slow down because of suspension problems. Nevertheless they finished first in the two-litre category. Thus he was hired by Amédée Gordini to race at Le Mans in a Gordini 15S with Jacques Pollet. Unfortunately, as in 1954, Da Silva Ramos had to retire after 14 hours because of a holed radiator. One week later, he began racing in F1 and entered the Dutch GP as a works Gordini driver. He finished 8th. He also entered the British GP (Aintree) and Italian GP (Monza) but mechanical problems forced him out of both races. 1956 was a busy year for the French-Brazilian driver. This season began as in 1955: 5th in Agadir with the Gordini 43, retirement in Dakar and victory at Montlhéry. Then he went to the Syracuse F1 GP to drive the official Gordini 16, the same car as the year before: he retired at mid-race. One week later he won a minor sportscar race in Tours (France). This reasonably successful beginning of the 1956 season continued thanks to a 5th place in the International Trophy and a 5th place in the Monaco GP with the new Gordini 32. Thanks to this 5th place in Monte Carlo and the two World Championship points scored, Hermano Joao Da Silva Ramos entered history as he remained the Brazilian driver with the most F1 World Championship points for 14 years running until, of course, Emerson Fittipaldi arrived on the scene in 1970. Although Chico Landi finished 4th at the Argentinian GP in 1956, thus giving the best result of a Brazilian driver until Emmo´s sensational debut season, but Landi took only 1.5 point out of the result as he shared his Maserati with Gerino Gerini. Those two points, with which Nano classified 19th in the 1956 Championship, were also the very last points scored by the Gordini team. After this result he went to the 1000km of Paris from which he had to retire because of an accident, having teamed up with André Guelfi. He then participated in the Supercortemaggiore in Monza where he finished 6th with Robert Manzon, another French F1 driver, who won the Naples F1 GP in 1956. Then, as many drivers did, he participated in the Reims 12 hours and the ACF GP on the same weekend. He respectively finished 7th, with Elie Bayol, and 8th. But the end of the season was not so good as he had to abandon from the British GP, from the Caen Grand Prix as soon as the first lap and from the Italian Grand Prix on the third lap. 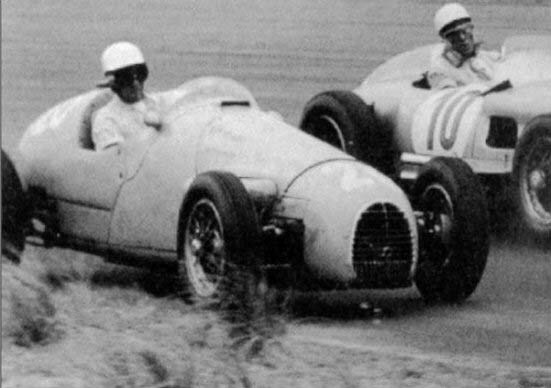 Sportscar races also led to disappointment: he retired at mid-race from the Le Mans 24 hours where he drove a Gordini 17S with Guelfi, in the Salon Cup (here seen second in the picture, with Guelfi in front) while leading the race, and in the Venezuelian GP. Hermano Da Silva Ramos remembers that before the start of the latter race, Fon de Portago took his hand put it on his heart telling him: “Do you feel my heart beating? This is what starting the race on the same line as Fangio does to me!” Just one good result was obtained at the Shell GP in Imola with a Gordini 39. After 1956 Hermano never entered a F1 Championship race again. Thus he participated in 7 official GPs but his career as a F1 driver was not over. 1957 was a very difficult season: it was the very last year of a Gordini team in dire straits. Nevertheless Hermano participated in two Grands Prix: in Pau where he finished 6th with the Gordini 32 and in Naples, with the Gordini 16, from which he retired because of brakes problems. In May, his friends Alfonso De Portago and Edmund G. Nelson died in an accident during the Mille Miglia. “The death of Fon, one of my greatest friends, was a terrible shock for my wife and me. She was pregnant and she had a serious breakdown because she was really scared for me, she did not want to see me continue racing, so I put an end to my career... for a couple of months. My son was born in October and I could not resist coming back to car racing.” In September 1957, in spite of this short break, he took part in the Tour de France for the first time, with Monnoyeur, at the wheel of a Jaguar. At the beginning of 1958 he bought a Ferrari 250 GT Berlinetta (chassis 0749GT) with his friend Estager. Thus the whole season was dedicated to GT cars. He only participated in one single-seater race: the F2 International Speed Cup in Reims where he finished 7th in a Cooper T45 entered by Alan Brown. In GTs, the season was much more successful with a victory in the 3 heures de Pau at the wheel of an Alfa Romeo Giulietta GT2 and a victory in the Spa GP with a Ferrari 250GT. With this car he also succeeded in finishing 5th in the Auvergne Trophy on the beautiful circuit of Charade and 3rd in the Tour de France with Estager. 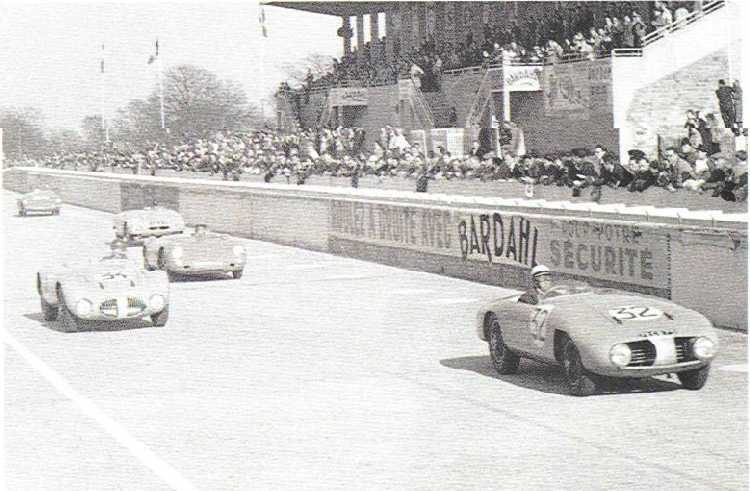 He also particpated in the 12 heures de Reims with Phil Hill, always with the 250GT but the French-Brazilian-American team (at the wheel of an Italian car... very international!) only finished 7th. The car was sold at the beginning of the following year. In 1959, Nano Da Silva Ramos was back in F1 and was hired by the Scuderia Centro-Sud to drive a Maserati 250F. Thus he could race in three British races. First he retired in the Glover Trophy because of an accident. In april he finished 4th at the 200 miles of Aintree. And in May he retired from the International Trophy because of gearbox trouble. About two months later he was hired by the Scuderia Ferrari to run at Le Mans, for the fourth time. “I have a lot of respect for Enzo Ferrari who was an extraordinay man but I think he did not respect his drivers and he did not care about their lives,” he said. However, he became the Brazilian with most participations in the famous French race. This record lasted until 1997 when Antonio Hermann was on the grid for the fifth time. But like the three previous attempts, the last 24 heures du Mans of Nano Da Silva Ramos was not a success: he and his team mates Cliff Allison and Dan Gurney had to give up after 4 hours because of the gearbox. The end of the season was much less disappointing as he won the tourism class in the Tour de France at the wheel of a Jaguar Mk1 with Estager.